Sizes from 4 ounces to 5 liters or more. Who Uses Bulk Essential Oils? When you want the very best for yourself and your customers, we can offer you the best quality bulk essential oils. We sell only the best aromatherapy quality essential oils: no adulterated or 2nd tier oils and no fragrance oil or synthetic oils. All of our bulk essential oils are obtained direct from growers & distillers or well-known and vetted sources. All of our essential oils are thoroughly tested for quality and efficacy (MSDS & GCMS profiles available). For more info about us, visit our webpage: About Artisan Aromatics. You can order by phone or email after initial approval. Use our contact form below to get started or for more info. Bulk prices are 50% to 70% less than our retail prices. Amount of reduction depends on the size of each item. Here is a link to our Retail Catalog PDF and another to our Bulk Catalog PDF. Since most of our retail and wholesale orders are for smaller sizes (1/2 dram to 4oz), and we like to keep our essential oil stock fresh, we usually keep only 1 to 2 liters of most essential oils in stock. We restock regularly and can supply you with any size or quantity you need. If possible, we’ll do our best to match or beat the price of any other reputable essential oil company (therapeutic quality only). So, if you need 4 oz or larger sizes of any essential oil or absolute, let us know. The more you order, the larger your discount. Bulk sizes are: 4oz, 8oz, 16oz, 1L, 5L. If you need any type of essential oil or aromatherapy product, we can supply it. We have the ability to supply large quantities of “ready-to-go” products. In the past, we have fulfilled orders for 50k vials of Lavender, 20k jars of salve, 100 aromatherapy gifts sets for a wedding, 1k lip balms for a dental office, etc. 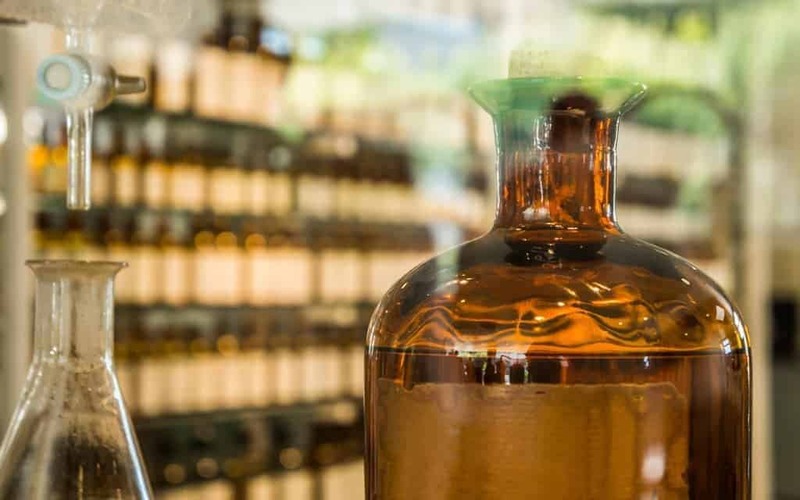 We’ve also blended, bottled and labeled over 2,000 bottles of essential oil blends and natural perfumes in just 6 days. We are able to supply a limited number of natural perfumers and natural cosmetic companies liter sizes of our very rare organic absolutes: Gardenia, Jasmine, Lily, Rose and Tuberose produced by the old method of enfleurage which uses no harsh chemicals. Prices per liter range from $8k to $10k. Supply is quite limited. We accept pre-orders with contracts. Not sure Bulk pricing is right for you? Wholesale prices (40% off most of our inventory / 25% off expensive oils and accessories) are available for businesses who sell our oils retail. If you want to use our products in your business but don’t sell products, request Practitioner status for your 30% discount off most of our inventory. If you’d like to buy in quantity and start your own brand, we offer Essential Oil Private Labeling.